I have been so busy creating content, photographing, & writing tutorials that I needed some play time this week. While the 2015 Polymer Clay Challenge does keep me busy & creating, it isn’t as freeing as trying something new. Yesterday I addressed in brevity the concept of burn out. You can read the article here. Because of my new studio assistant, rather than having long work day, I have very short working spurts. Regardless, let’s see what I’ve been working on this week. It’s no secret that I am a color addict. I love color. I love making my own colors too. This rainbow blend was made entirely from scrap clay. Some of it is metallic and some of it has glitter and some is just color … but overall I think it gives a lovely appearance. Last week’s dragons were a lot of fun. They were inspired by the continuous sub-zero temperatures we had here last week. Every day was around -5 to -25 degrees Fahrenheit. Yep … that’s more than cold! You can see the finished dragons & projects from this past week here. I did try to get a lot done in my studio. So far, my new assistant is a rather good girl! She comes down in my studio with her toys and we play for a few minutes. Then I get to work and she plays by herself. Because she’s just 9 weeks old, so often needs held & cuddled. I’m sure this is because until we adopted her, she had siblings to play with and cuddle … now it’s just us. 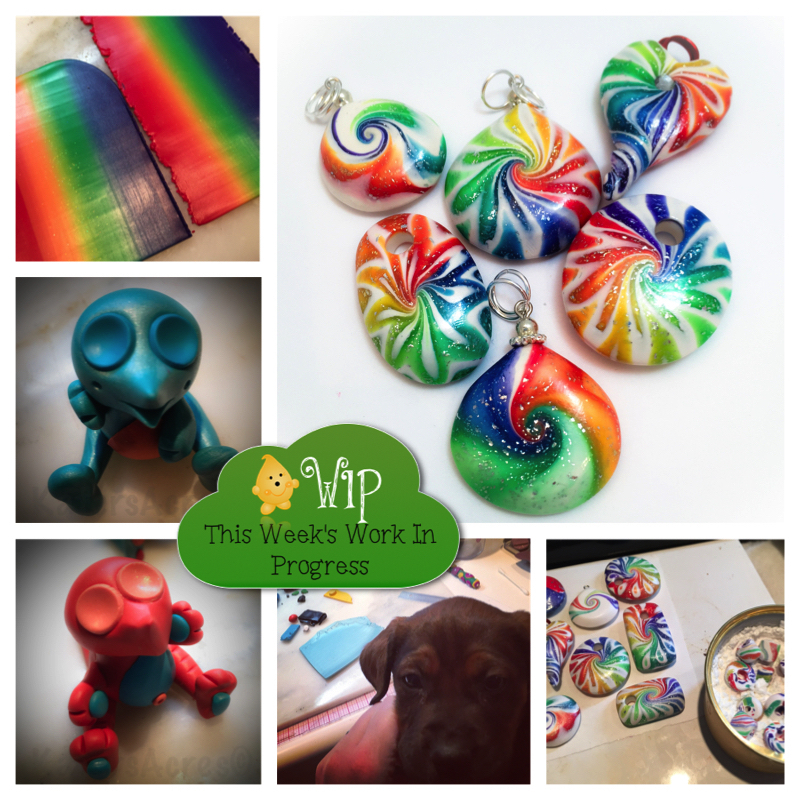 Polymer clay bead & pendant day! It’s been a long time since I sat and made beads. We all know how I feel about jewelry, just not inspired by it much. I have a lot of craft shows coming up and my simple pendant necklaces are great sellers. You can get details about the tutorial I used to make these pendants here. Most of the photos above were featured throughout the week on Instagram. Be sure to follow me there to see lots of behind the scenes fun! Post by The Blue Bottle Tree. This week’s polymer clay inspiration comes from none other than my friend, Ginger Davis Allman of The Blue Bottle Tree. Ginger is probably best known for her science-like discovery & investigative posts about polymer clay (not to mention some awesome tutorials). Ginger showcased this photo on her FaceBook page this past week. I absolutely love how Ginger’s faux tutorials are so realistic. You can get this Faux Glass Tutorial to make sea glass, roman glass, & carnival glass here. It’s been so cold here I am beginning to look & feel like a snow bunny. I wear no less than 3 layers every day … why yes, I do look rather oompa-loompa-ish! It’s been so cold that my studio, which can usually heat up in less than an hour, takes over 3 hours to heat up now. Let’s just be honest, ice cold, rock hard, stiff clay is just NO fun to work with.